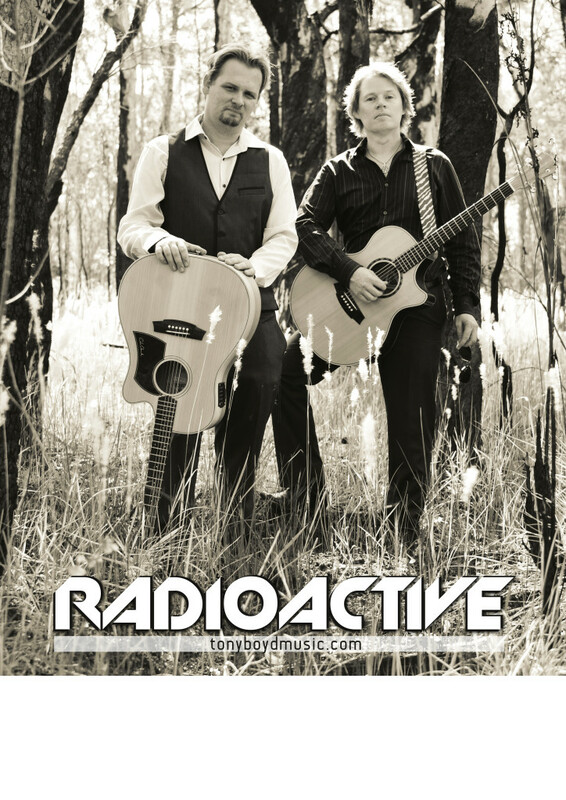 With a mix of new and classic rock & pop, the Queensland Sunshine Coast based RADIOACTIVE duo or trio is perfect for corporate events, weddings, or any special occasion. Playing your favourite songs with their own unique flair, the duo has a wealth of experience. With tight guitar, lush harmonies, and inspirational lead vocals that will leave you in awe, the magic of this combination is in the feel and energy that is in every performance. 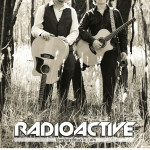 RADIOACTIVE also performs as the all Aussie tribute duo/trio OZCOUSTIC! 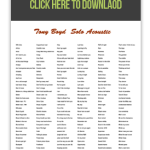 Tony brings a wealth of industry experience from his time living in Melbourne. With his trademark powerful voice, massive vocal range, and unique acoustic rhythm guitar style , every performance is bound to turn heads and make for a memorable occasion. Tony has years of experience performing in many lineups at both private functions and public venues, and previously also spent time as a function/wedding DJ and MC. Major shows include 4 years playing Melbourne Crown Casino and regular appearances at Aust Open Tennis. 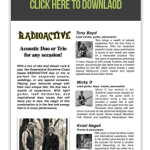 Tony now runs and performs in multiple successful Sunshine Coast based lineups including solo shows, RADIOACTIVE, SUNSET BLISS, DRIVETIME, & OZCOUSTIC. 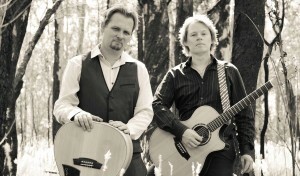 Micky D has worked in the Sunshine Coast music industry for 20 years. His bass and guitar skills & percussion bring a flair that provides a unique feel & style setting Radioactive apart from the rest. Previously whist playing with well known local acts he has performed alongside many Australian Iconic bands. Shows include Woodford Folk Festival and headlining Mooloolaba’s New Year’s Eve main stage celebrations. In addition to RADIOACTIVE & OZCOUSTIC, Micky also performs and fills in with multiple elite cover acts and performs as Flea in the Australian Red Hot Chili Peppers Show. Rob began his drumming career in the rock driven ‘90s. Rob was an integral part of Brisbane lads Pharaohs Playground who credits included national touring, 4 studio albums, single on triples J’s 3 hours of power compilation “THIRTEEN”, music videos on RAGE and major support slots with THE DIVINYLS, 30 ODD FOOT OF GRUNT and THE CHOIRBOYS. Rob has also enjoyed playing with multiple corporate cover bands over the years. 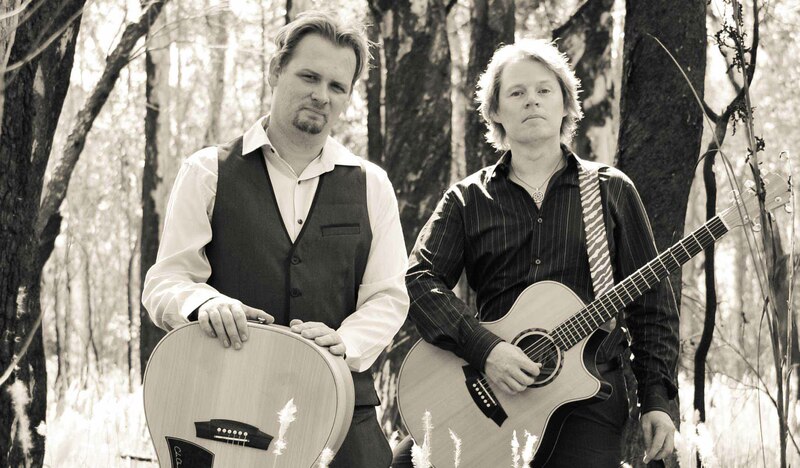 Currently, Rob drives part of the rhythm section with Brisbane band GOOD WILL REMEDY and the highly versatile Sunshine Coast function cover acts DRIVETIME, RADIOACTIVE & OZCOUSTIC.